The organisers of Velo Birmingham & Midlands have come under fire from local concillors after announcing changes to the route of their closed road sportive. With six weeks to go until the event, CSM Active sent letters to entrants and local residents last week detailing the route revisions. Up to 17,000 people are expected to take part in the event, which takes place on Sunday 12 May on a route that starts in Birmingham and passes through Coventry and surrounding countryside. 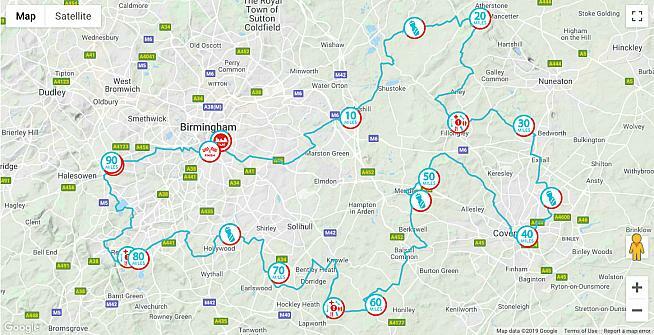 Spot the difference: the original route of Velo Birmingham (above) and the revised route (below). Although the route changes are minor, the timing and communication of the revisions have been criticised by some local councillors. The Birmingham Mail reports concerns raised by Conservative councillor Debbie Clancy (Longbridge and West Heath), who stated: "The event will have an impact on many people for instance anyone travelling to work, visiting elderly relatives, social family events generally shopping, getting to the airport etc. "When you look at the size of the route you can understand why residents within the route will feel trapped should they need to get through the route barriers." Fellow Tory councillor Deirdre Alden (Edgbaston), whose ward lies in the final sector of the route and is set to be disrupted for the longest period of time on the day - 8.15am to 7pm - joined in the criticism. "My particular annoyance is that the route through Edgbaston has been changed with no notification to either councillors or residents until now," said Cllr Alden. "People who live on the route may well have organised events, thinking that the route (as published in December) was not going to be along their road - only to find at this late stage, that it is. This is unforgivable." Organisers CSM Active have attracted criticism in the past from residents affected by road closures on their sportives, which include Velo South and the new Velo North event as well as the revamped Velo Birmingham & Midlands sportive. They have issued thousands of leaflets with information on road closures to local residents, and appear to be taking seriously their responsibility to communicate with affected residents. A spokesperson for the Velo event said: "Route changes are a result of on-going planning and consultation with key stakeholders, transport providers and agencies to ensure that we maintain as much access as possible across the West Midlands and minimise disruption. "While we acknowledge that the changes will affect some areas that previously weren't impacted, they significantly improve access across the West Midlands, particularly in Birmingham. "A second letter drop to thousands of homes and businesses with key information including the route changes started on Monday, March 25. The new route is also available to view at www.velobirmingham.com." Anyone with enquiries about the Velo Birmingham & Midlands route and how they may be affected can email [email protected], or call the answering machine service on 0121 396 1296.